WATCH THE CONFERENCE HERE. Use the information icon (i) in the bottom navigation menu to view the conference agenda and navigate to individual panels. The California Environmental Quality Act took effect 40 years ago. Four decades later, it’s appropriate to take a detailed look at CEQA, California’s most important environmental law. The California Environmental Law & Policy Center is proud to announce a major CEQA conference that it and the U.C. Davis School of Law will host on Friday, November 4, 2011. This timely event will bring together policymakers from all three branches of government, environmental lawyers, academics and students for a thoughtful examination of CEQA’s history and future. 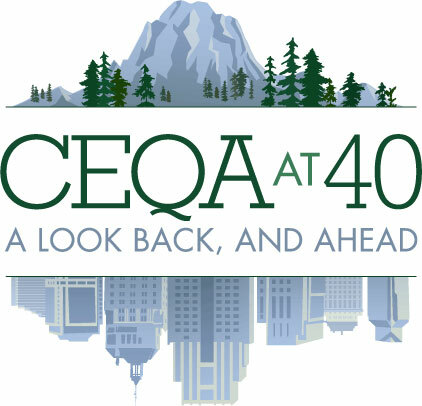 This conference will provide a thoughtful review of the first 40 years of CEQA, focusing on how the law has developed since 1971, as well as comparisons with the concurrent evolution of the National Environmental Policy Act (NEPA), “little NEPA” statutes in other states, and environmental impact laws from foreign nations. Equally important, the conference will focus on CEQA law and practice in the years to come. CEQA remains highly controversial, and a major policy and political debate is currently underway as to whether and how CEQA should be revised to address such challenging issues as renewable energy siting and climate change. This King Hall-sponsored event will bring together expert litigators, lawmakers and policymakers to address the questions of how well CEQA has stood the test of time, if changes to CEQA are warranted and, if so, what those changes should be. This November 4th conference brings together an expert faculty: legal and policy experts who have worked with CEQA since its inception, academics who’ve studied it intensively, and policymakers responsible for both CEQA’s current administration and potential reforms. Opportunities for faculty-audience interaction will be featured, and scholarship arising out of the conference will be published. The conference will be held in the U.C. Davis School of Law’s new, state-of-the-art facilities. Lunch will be provided to conference attendees, a reception will follow at the end of the day, and eight hours of continuing legal education (MCLE) credit will be offered to California attorneys who seek it. Please visit the conference agenda page to view a detailed program for this event.